E-waste is an environmental hazard. Carelessly trashed electronic devices give away dangerous chemicals that pose the risk of seeping into the ground and spoiling the resources, for forever. You, me, all of us know this. Yet, only a handful of us is cautious enough to not to add on to the digital rubbish by throwing away our electronic junk. You are one of them. Rather than just tossing them away in a scrap yard, you’ve decided to sell your used telecom equipment to us. Congrats on being one of the responsible ones in this digital clutter. So you’ve sold your telecom equipment to us – quoted, packed, signed. Curious to know what happens next? 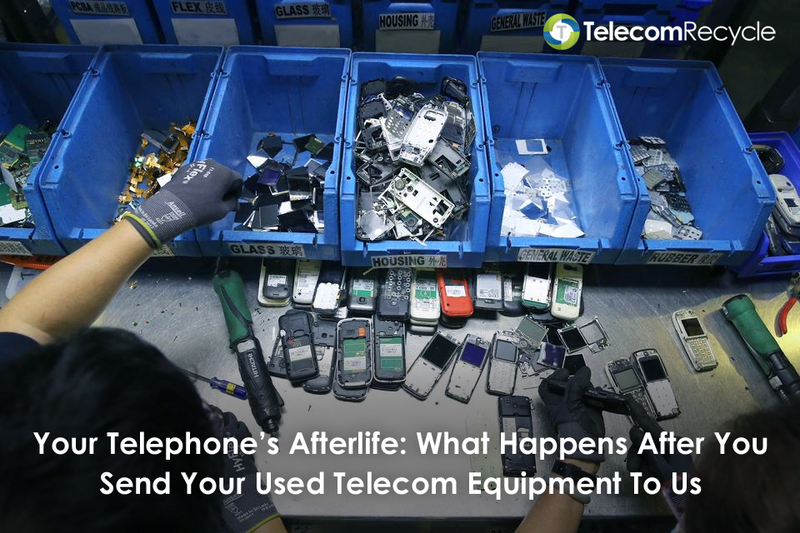 In this article, we’ll help you understand your obsolete telecom equipment’s afterlife as it enters Telecom Recycle’s threshold. Of the equipment that comes to us, around 40% is pretty much reusable. More often than not, they were previously owned by businesses that got caught in an unfortunate situation – think downsizing, acquisition/merger, bankruptcy – and couldn’t afford to keep their redundant, (now) useless telecom devices and cables. They needed quick cash and Telecom Recycle got them just that. The remaining 60% is made up of unwanted telecom parts and stuff that are too ancient for anything beyond recycling them for usable metals and such. As a R2 certified recycler, we take care of these scraps, responsibly – following local and National regulations. We know how burdensome it can be to handle telecom network assets – operational or obsolete – for organizations. That’s why we have built an asset disposition and recovery ecosystem so you benefit the most from your used telecom equipment. We run an exclusive refurbishment campaign for all the reusable items. Telecom assets are sorted, labeled with their current physical/software status, and shipped for a thorough quality check. They are then furbished to almost perfection and put up for sale on different channels, allowing other companies to make full use of it. Telecom equipment with little to no market value makes up for our recycling campaign. Prior to disposition, the assets are passed through a rigorous dismantling session. Things that can be saved are labeled and saved for reuse. Metals are sorted and precious ones (like Gold, Silver) are sent off to our center. Rest is either incinerated or disposed of safely and responsibly, by following the government laid regulations. Before carrying on with any of the above processes, we make sure to wipe off any data from the equipment. The owner is then handed a certification of destruction so they know their valuable data cannot be exploited anymore. At the end of the day, our primary objective to help businesses manage their old and surplus equipment by selling them to us at market prices. But, we also help you be a responsible citizen by taking care of your e-waste (mainly telecom equipment) so they don’t go toppling into landfills.